Cooper's left-handed chamfering drawknife. 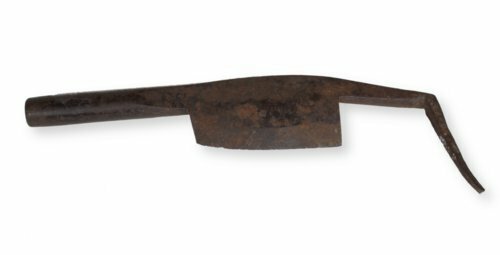 James Cracroft used this tool while he was working as a cooper in Kansas from 1867 until his death in 1900. He brought coopering tools from Indiana at the close of the Civil War, first using them in Fort Scott, Kansas, until about 1880 and thereafter at Hartford, Kansas. Coopers made barrels using special tools like this chamfering knife.